“CELINUNUNU liberates children from the traditional roles of boy/girl, and enables younger people to grow on values of equality with the freedom to strengthen their own power of personality based on mutual respect,” the website for the clothing line states. “People, and for that matter—little humans, express themselves through clothes. We would like to enable them to be who they are, so that their choices are driven by their own true essence and free spirit, beyond stereotypes or any norm,” it outlines. Dion, known for her secular hits “My Heart Will Go On,” “The Power of Love” and “Because You Loved Me,” announced her unisex clothing line via a video dramatization on Tuesday in which she is chased by security guards and placed in handcuffs after making her way into a hospital nursery to change the blue and pink differentiation for boys and girls to the neutral black and white. Dressed in all black, she then removes a box from her handbag that is filled with black flakes and blows it into the air. Instantly, the boy and girl symbols displayed on the wall disappear and change to plus signs, which stand for equality. 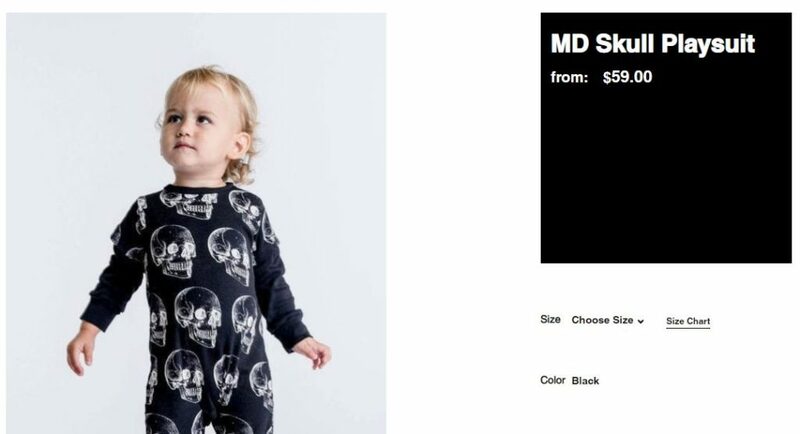 The pink and blue onesies that the babies had been wearing also are instantly changed to the black and white outfits of Dion’s new clothing line. “The dialogue between clothes and creativity/art amplifies the discussion about a humanistic education, which is gender-free, strengthens the power of personality, and gives the spirit space to grow. This is the education that fashion can instill, based on the concept of equality and respect for mankind,” the website for CELINUNUNU states. Items in the clothing line include black and white onesies with stars, letters or skulls. One also reads “New Order.” Children’s items also include black, white or yellow sweatshirts and leggings with skulls or stars, tees with geometric designs, and pants with plus symbols, which stand for equality. “The new label that never labels. Free children to choose who they are,” Dion posted to Twitter on Friday. Dion’s endeavor is a partnership with the company NUNUNU, led by Iris Adler and Tali Milchberg. “This is our small contribution to changing the world,” Adler said. Public reaction to the clothing line has been mixed. “Celine never said there aren’t boys and girls. Nor did she say boys can’t wear blue and girls pink. She is simply saying that you should allow children to be who they are and not impede them on their path to self-discovery. Simple concept that many are afraid of apparently,” one commenter wrote. “How do you make them find their ways if they wear uniforms? And sadly, this uniform has [a] clearly bad message: black and white without colors and with skulls; doesn’t make their soul grow! And the point would be that!” another opined. As previously reported, the Scriptures state that God made the woman as a complement to the man (Genesis 2:18), and the two sexes are to be distinct in their presentation. “The woman shall not wear that which pertaineth unto a man, neither shall a man put on a woman’s garment,” Deuteronomy 22:5 reads. “Doth not even nature itself teach you that if a man have long hair it is a shame unto him? But if a woman have long hair, it is a glory to her, for her hair is given her for a covering,” 1 Corinthians 11:14-15 also says.